International superstar chef Gordon Ramsay was the star of the hit U.K. reality television show Hell's Kitchen which reached 10 million viewers weekly. Now he's bringing the concept to American shores, with the show by the same name scheduled to begin airing in January for 10 weeks on Fox on Thursday or Friday nights at 9pm. Ramsay's brutally-honest opinions and volatile temper are sure to make the show a sensation as contestants compete in a restaurant kitchen to avoid being voted off. The final contestant wins the keys to the restaurant. In the Heat of the Kitchen will be Gordon Ramsay's newest cookbook, published just in time for the launch of the new reality TV program, and will feature recipes used on the show. 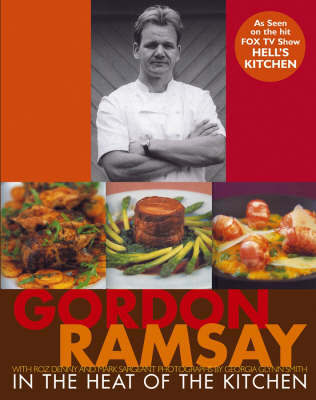 More importantly, the book offers insight into the mind of a world-renowned chef in the forms of Cooking Tips and Chef Secrets, alongside divine recipes such as Green Herb Risotto with Sauteed Scallops, Spice-Roasted Duck with Sweet Sour Sauce, and Pan-fried Salmon with Bacon and Red Wine Sauce. Step-by-step technique photos and gorgeous food photos accompany the text. Gordon Ramsay's Sunday Lunch: and Other Recipes from "The F Word"
Gordon's Greatest Hits: Recipes from "The F Word"